I was recently contacted by ModCloth to participate in their Uniquely You campaign. Since I've been in love with ModCloth for years, I couldn't help but to accept. They provided a few select bloggers a photo of a current ModCloth favorite, and challenged us to style it using only ModCloth items on Polyvore. Aw the doorman as you slide the classic trench coat off to reveal the wonder of this dress. The Evening of Extravagance dress is a gorgeous evening dress with floral lace on the skirt and a naturally bouncy composure with a tulle underlay. I wanted to balance out the red by having it on the top, in the middle and at the feet, so I channeled the the Old Hollywood feel of the dress by pairing it with those classic colors: red and gold. I paired the dress with interesting tights and red pumps, a red wallet clutch and a red hat that screams vintage, but also of Blair Waldorf. And, to top it off, I added a dimply yet gorgeous gold necklace for extra extravagance, and a simple trench coat, for warmth. 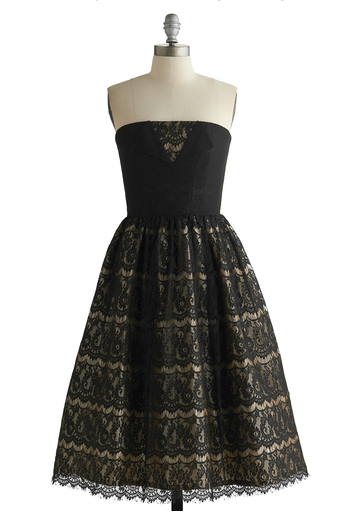 Besides this wonderful dress, ModCloth offers so many different other dresses! And, they offer plus size, which is an amazing thing if you love vintage inspired dresses.